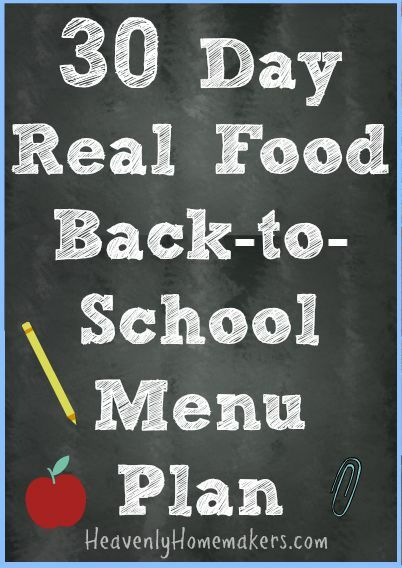 30-Day Back-to-School Real Food Menu Plan time! 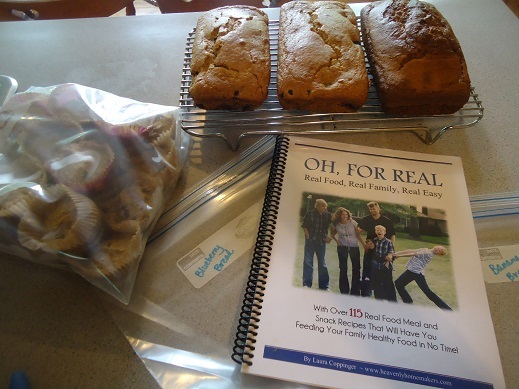 I’m excited to share that I’ve made a list of one entire month’s worth of real food meals – breakfast, lunch, and dinner/supper. Why? Because school is just about to begin (or already did for some of you). I personally thought it would be valuable to avoid thinking about how to feed the hungry school children since I will, of course, be joyously reading for hours each day with my offspring about the adventures of Lewis and Clark and having fabulous discussions about planets, galaxies, and Ralph Moody. During the times I’m not joyously reading, I will be joyful at a soccer field or in a car dropping or picking up a kid from a music lesson. 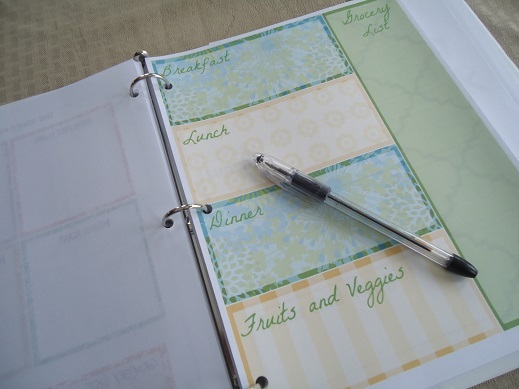 I will be way too joyful to think about meal planning. Assuming you also have much joy during the back-to-school season – I thought maybe you’d like this resource too. Don’t look now, but I’m absolutely not going to stick with these lists entirely. I’ll use it as a reference and guide. This is 30 days worth of real food meals at a quick glance to ease us all back into a school routine. Now that is JOY! We’ll begin with breakfast, head into lunch (for the homeschoolers among us), then land on dinner/supper. As much as possible, I plan to (or already) have foods prepped ahead and put into the freezer so that all I have to do is pull them out and thaw/cook/serve. Everything else will be easy to put together. Scrambling eggs takes no time at all. Right? Right. 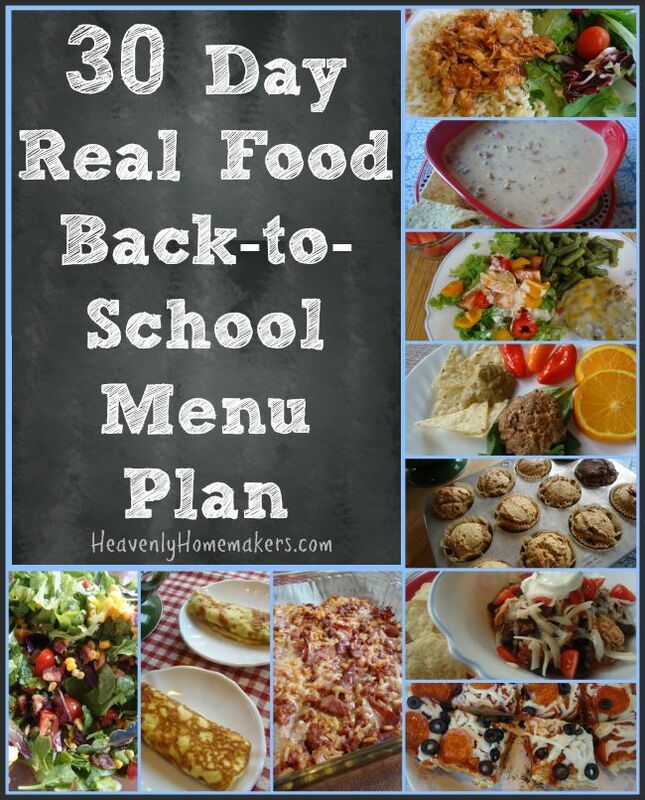 Today you can download this FREE 30-Day Real Food Menu Plan Resource to keep handy during this busy time of year! Not only that, we’re always offering free printable learning resources you won’t want to miss! This post was originally published in June, 2011. I still love jars. It is no secret that I love jars. Big jars, little jars, tall jars, short jars…they’re all useful. One of my favorite ways to use jars is to store leftovers. The regular jars are fine and I like to use them for canning produce and such, but give me a wide mouth jar and I can do all kinds of things with it. You can fit your whole hand into a wide mouth jar, making it easy to wash or to put food in and take food out. The best thing about having leftovers (and other food) in jars is that you can clearly see what is in the jar, unless of course the jar somehow got shoved to the back of the fridge and forgotten, causing it’s contents to change somewhat in appearance. Not that any of us would ever let that happen. But really, I can open my fridge and easily see if I need to make more Ranch Dressing, if we have any homemade sour cream, if we have enough cooked chicken to make dinner and what kinds of leftovers are available for lunch. As you saw in this post, my fridge is full of jars of all shapes and sizes. Let’s talk just a little bit about those jars, because many of you have asked what kind I have and where I get them. Pint and Half Pint wide mouth jars are wonderful for storing leftover vegetables, small bits of casserole, little portions of leftover meat, etc. I have a nice variety of wide mouth pint and half pint jars that I can grab depending on what I need to store. These wide mouth pint jars are great for my homemade dressings and homemade peanut butter. Someone gave me this set of Ball Wide Mouth 1/2 Pint Elite Jars for Christmas last year and I LOVE them. 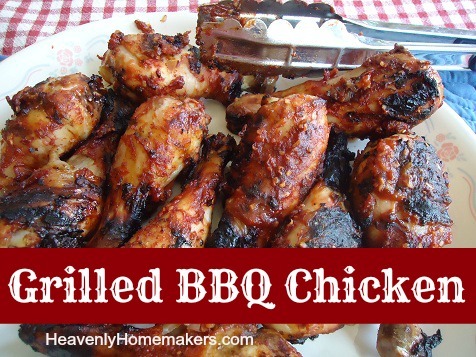 They are short and perfect for small amounts of leftovers. They’re also quite cute, not that it matters, but shucks cute jars are fun. My favorite, favorite, absolute all time favorite kinds of jars for leftovers are the Elite Pint Sized jars. When we were going through my mom’s canning supplies after she died, I found loads of them and brought them home. 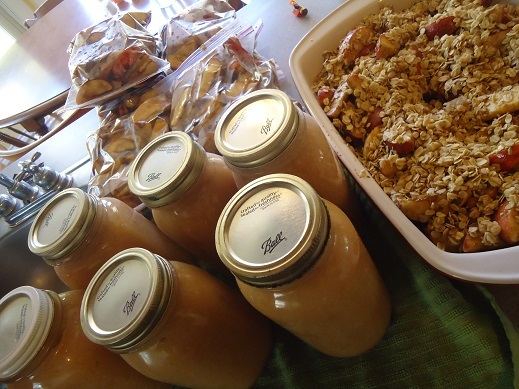 I love canning with them and using them for leftovers. They are the perfect size for me to use at least 80 different ways in my kitchen. And they are from my mama. Of course I love them best. 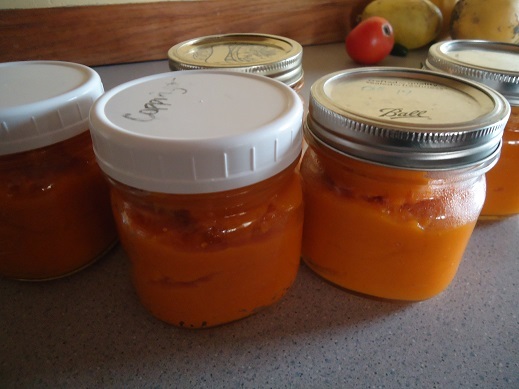 I also use Quart Sized Wide Mouth Jars constantly, both for canning and for storing leftovers. I find the quart sized wide mouth jars work great for storing leftover soup, sloppy joe meat, cooked chicken, creamy mac and cheese, etc. In addition, I have several sets of Wide Mouth 1/2 Gallon Sized Jars, which I use mostly for our milk, but also for chicken broth and large amounts of soup. I buy these Wide Mouth 1/2 Gallon Sized Jars from Azure Standard, but you can also get them from Amazon or sometimes at hardware stores. Which leads me to: Where is the best place to buy jars? That’s hard to say. You can get several different kinds from Azure Standard if this is accessible to you. 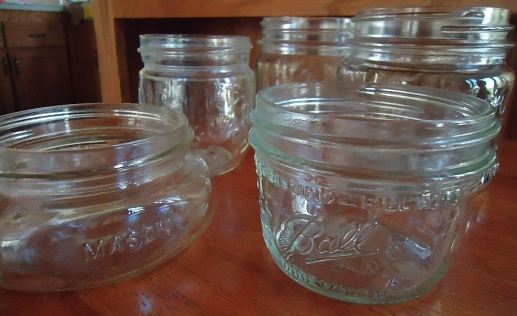 The best place to find jars for very little money is yard sales or auctions. I’ve also acquired many jars from people who are simply not canning anymore. 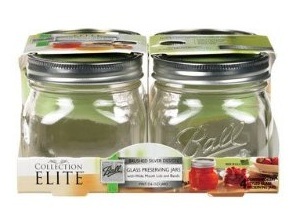 It pays to ask around to see who might have jars they’re not using anymore – they are usually happy to get rid of them! If you’re going to purchase jars, like some of the specialty sizes I mentioned such as the Elite which are harder to find, I’d say you are making a pretty good investment. They’re less expensive than tupperware, and because they are glass, they are safe and will not leach plasticy chemicals into your food. Being able to see your food in the fridge is an invaluable time saver. By the way, I love having a drawer full of Wide Mouth Plastic Lids, which makes it super simple to fill the jar and throw leftovers in the fridge. I have Regular Mouth Plastic Lids as well, I love having both. They’re so clean and nice! One last thing: for storing leftovers like lasagna or hamburger patties – foods that would be hard to put into a wide mouth jar, I love having these Pyrex dishes with lids. 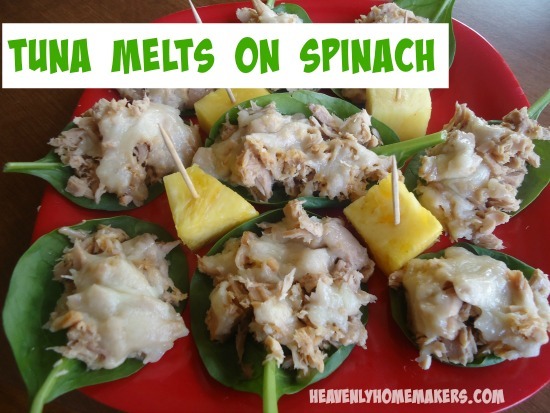 They are fantastic for storing leftovers and warming them up in the oven or toaster oven right in the dish. Phew. Well, you just found out way more about my leftovers than you ever wanted to know. Again, let’s just be clear that I was not calling you a Wide Mouth. Although, after reading my post, you would realize that even if I was calling you a Wide Mouth (which I wasn’t), it would have been a compliment. How do you store your leftovers? Here we go! After weeks (months really) of planning and working toward this weekend – we are here. 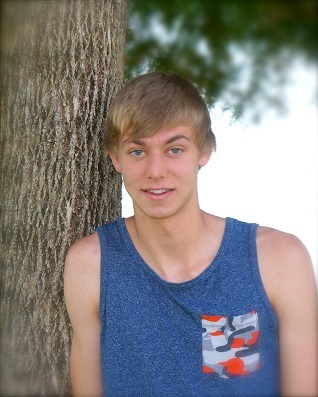 Our oldest son, Asa, will be graduating on Saturday and will have a big reception on Sunday afternoon. Then on Sunday, it will be “Senior Sunday” at church. That is always such a blessed event, and I’ll be sure to use more kleenexes. That afternoon, we’ll have a joint reception with some fellow graduates in our church fellowship hall. It’s going to be so much fun!! We’re planning on a lot of people coming through that day! I’ve been making and putting some food in the freezer as I’ve been able. Beyond the homemade food, we’re going with some “less than healthy but who cares because it’s celebration time” options. This is what splurges are for, right? Here are a few pictures of what I’ve been working on in the kitchen. 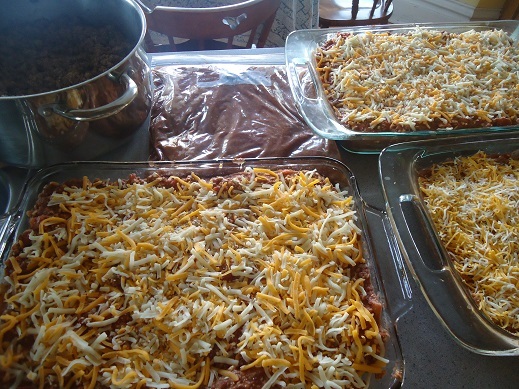 A few weeks ago, I made three lasagnas, three pounds of taco meat, and three pounds of sloppy joe meat. They are in the freezer waiting for the weekend. Yesterday I baked a loaf of banana bread and two loaves of blueberry bread (using my muffin recipe). Then I mixed up a double batch of both chocolate chip muffins and pumpkin muffins. I didn’t bake them, but froze the batter for fresh-baked muffins this weekend. Read here to learn how that awesome little method rocks my world. 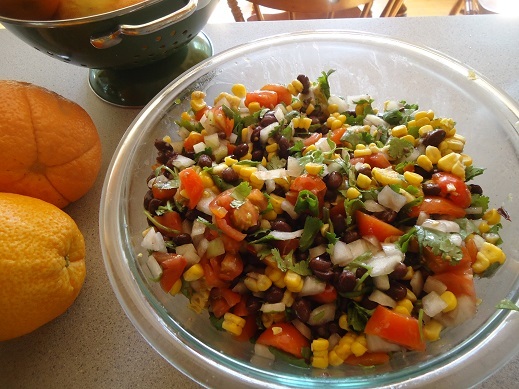 Today I made a bowl of Black Bean Salsa to go with our lunch. I made enough to serve over the weekend too. Such a great taste of summer in that bowl! You’ll notice that I asked a few people to help out with the food. ALWAYS say yes to help during a busy time like this. If someone offers, say yes. It’s as simple as that. There’s too much to do during an event like this to try and get it all done by yourself. Plus, it is really important to enjoy these moments. I look forward to being hostess this weekend, but I really, really look forward to being MOM. Well friends, those are my scattered thoughts for the day as I type with paint on my hands. (The sun finally came out so I’ve been out painting our porch all day!) I’ll try to pop on from time to time with other posts this week because I do have a few in the works. 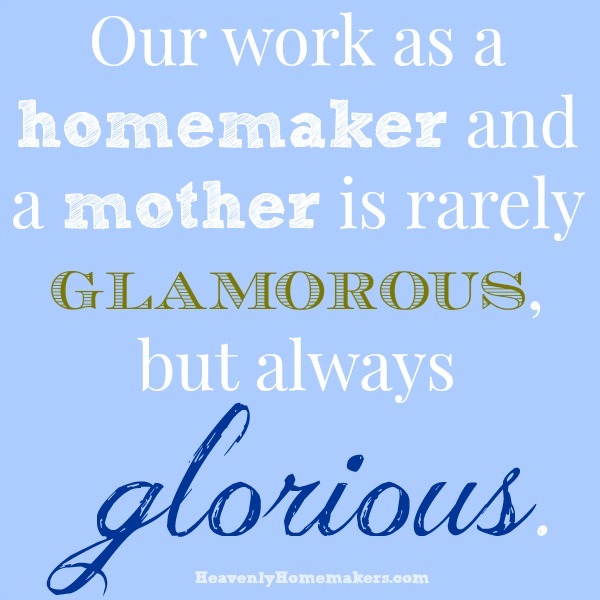 Here’s a little something worth noting: Our work as homemakers and mothers is glorious, but rarely glamorous. I spent some extra time online this weekend, researching new recipe ideas for the holidays. All of the pictures I came across were so pretty, the end result of the recipe was so perfect, and I almost started feeling overwhelmed with trying to keep up with the Joneses (or the Pinterest Queens as the case may be). Then here I was, ready to post pictures of some of the very simple (but ever so helpful) tasks I got checked off my list this weekend so that I can try to better manage my wife/mom/school/work/ministries life next week. None of my pictures even look exciting, much less pretty or pin-worthy. And don’t look now, but I was so busy cooking and writing on Saturday, I never even made it upstairs to change out of my pajamas. Glamorous? Not even a little bit. Glorious? Absolutely. I love the life God’s given me. Friday afternoon I washed and poked three lovely squash our neighbors had grown in their garden and shared with us. Into the oven they went. 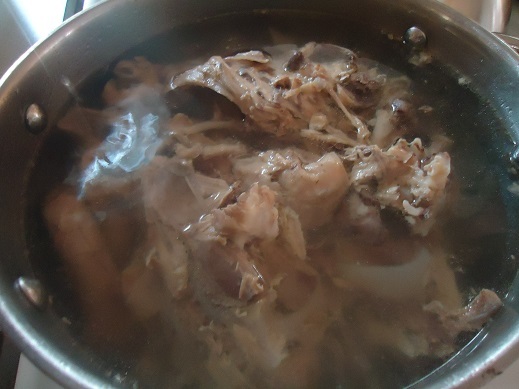 Then, I pulled out the chicken carcasses I’d saved from last weekend and set them to boiling for broth. You’ve got to admit, a picture of chicken carcass floating in water is almost glamorous, yes? About 1.5 hours after I put the squash into the oven, I pulled them out, took out the seeds, scooped out the inside, and pureed it. I now have five 2-cup portions ready to use for upcoming baking projects. 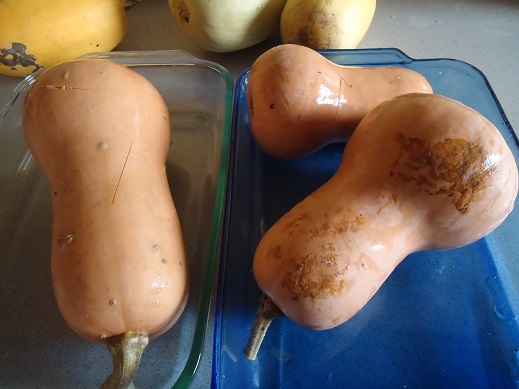 I use this squash in any recipe that calls for pumpkin. No one can tell the difference. Friday night after the broth was finished, I strained out the bones and cooked rice directly in the broth. 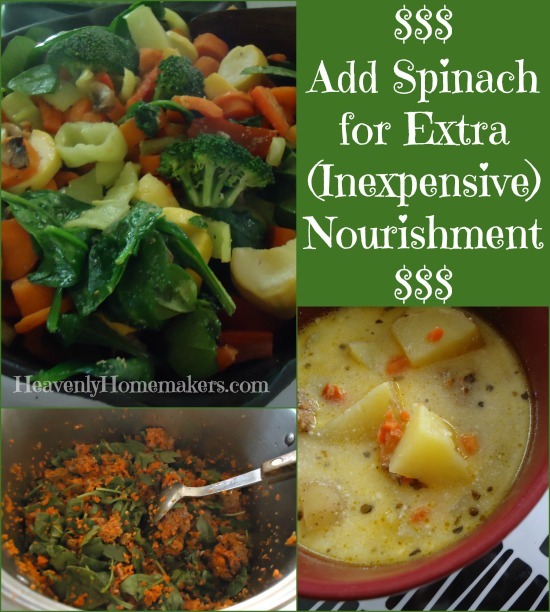 I also threw tons of carrots and spinach into the pot. 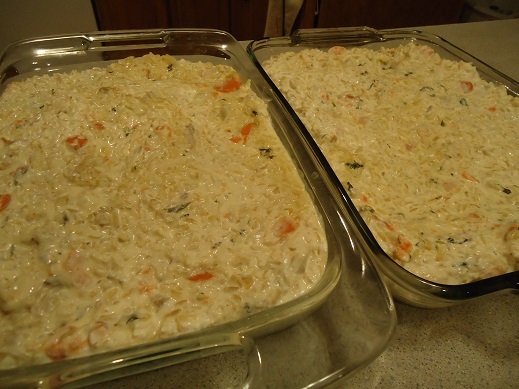 Once cooked, I stirred in chicken and other ingredients to make Creamy Chicken and Rice Casseroles. One went into the freezer for another time. The other went into the fridge for my family to eat this week. Saturday we ate leftovers all day (a perk to having only three people at home all weekend). I was barely in the kitchen at all except to make a quick batch of Chili and double recipe of Coconut Fudge Bars for this week. Oh! And I finally finished the “Build Your Menu Planning Notebook” I’ve been working on for the past several months. I’ll be sharing all the details about this on Monday once I get it uploaded into my shop. 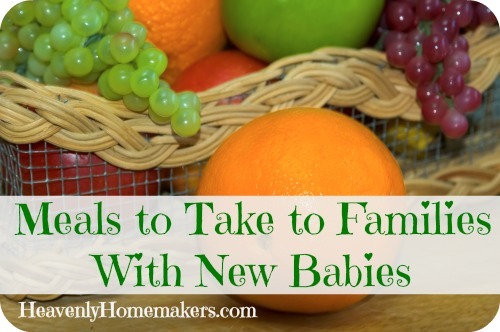 You are going to love this new fun and helpful resource! 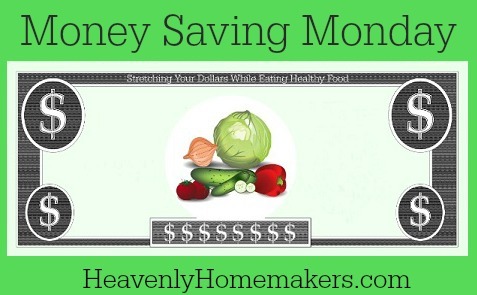 Nothing about meal planning is particularly glamorous, but saving your family money and feeding them nourishing meals? It is glorious. I can’t tell you how much fun I had printing and putting together my own personal Menu Planning Notebook! I got seriously giddy as I picked from all the pages and then built a notebook to suit my needs. Details soon! Sunday night, about 30 youth and adults will be meeting at our house for High School Huddle. I’m making baked ham, green beans, fresh pineapple, relish tray (carrots, cucumbers, sweet peppers, and ranch dip), French bread (store-bought, yay me!) 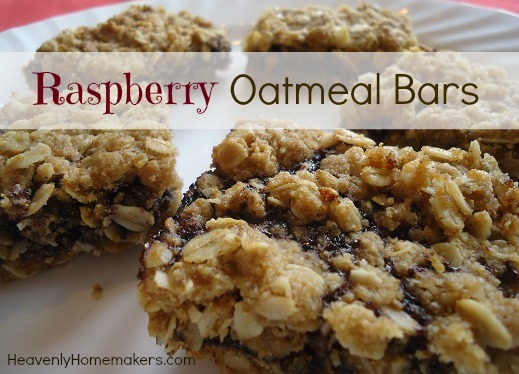 and butter, and oatmeal chocolate chip cookies. 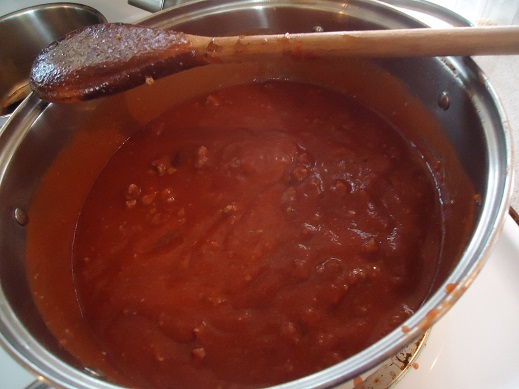 Here’s to floating chicken carcasses, a simple pot of homemade chili, menu planning, and the glorious lives we can all be thankful for as homemakers! Last week’s new (to me) menu planning idea worked out pretty well! 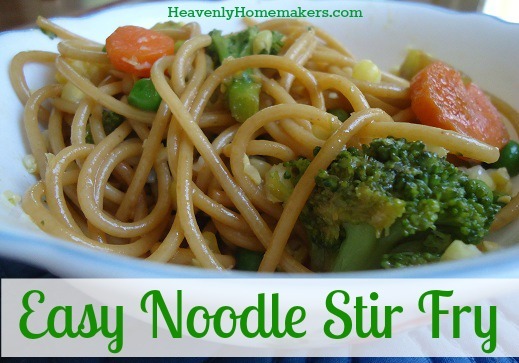 I loved the flexibility, knowing I could make anything on the list for any meal of the week. The great thing about menu planning is that there are so many ways to go about getting yourself organized. One thing is for sure though – menu planning always saves money, time, and energy. This is why I talk about it so often here and share my menu plans with you. Want to know a little secret? It’s about menu planning, and it’s different from anything we’ve offered here before. We’re almost finished creating a really fun menu planning resource packet to add to our shop. It’s full of printables for you to pick and choose from. 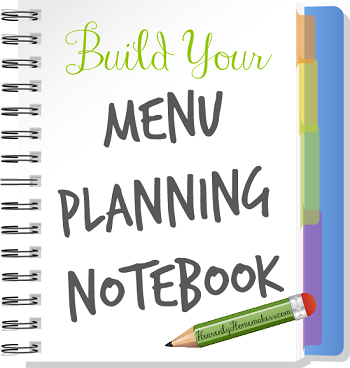 Then based on your needs and preferences, you build your own menu planning notebook. It’s a never ending resource of fun and organization. Who says menu planning can’t be FUN!?!?!?! 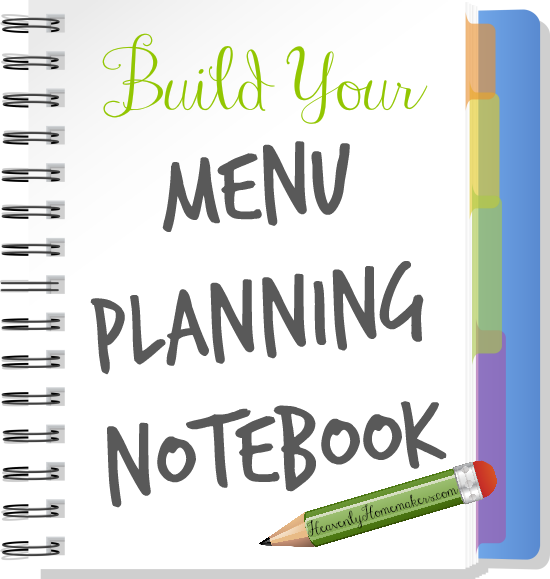 That’s a sneak peek at the cover of the “Build Your Menu Planning Notebook” packet. More details to come as we finish it up and offer it for sale. I can’t wait to share more about what this is like. Watch for it soon! 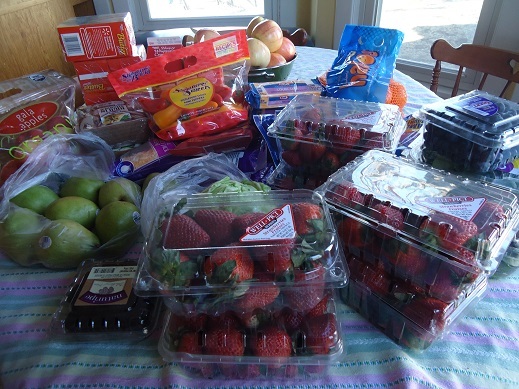 In other news around the Coppinger household, we are still buried under apples. It’s a wonderful and tasty “problem” to have. 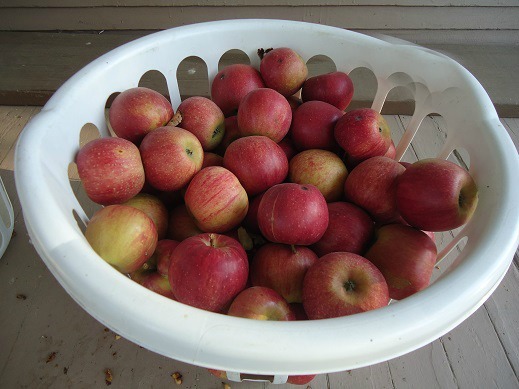 :) I made 17 more quarts of Applesauce this weekend. 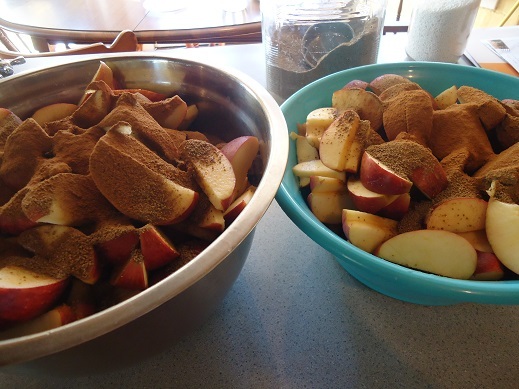 Then I mixed up 9 quarts worth of Apple Pie Filling. Instead of canning the filling, I froze it in bags. This girl, if you can believe it, is almost out of jars! That’s what happens when you are having a fantastic produce year! 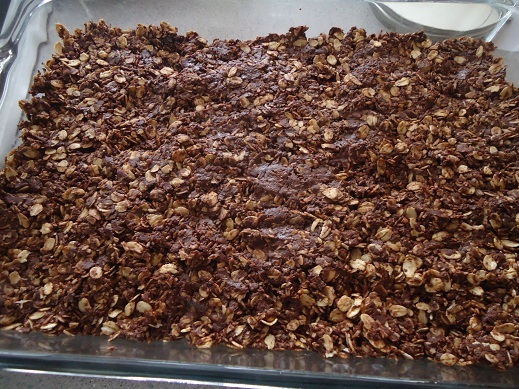 I also made a big Apple Crisp for a Fall Festival at church Saturday night. Apples, apples everywhere! What’s on your menu plan this week? Praying your week is off to a great start! You’ll notice in my menu plan below that I am serving this dip twice today – once this morning for a college age Bible class Matt teaches at church; and again tonight for the teens who come to our home for Bible study and fellowship. Be sure to download our free new Fall Menu Planners here. Yep, both Asa and Justus are at camp this week. This means I’ll need to try and remember to make less food for each meal. It is when my 14 and 17 year olds are gone that I realize just how much food the two of them eat. Wow. Speaking of camp, Matt and I (and the two younger boys) will also be heading that way a week from today. Since church camp is such a huge part of our kids’ lives, Matt and I really want to be a part of it with them. 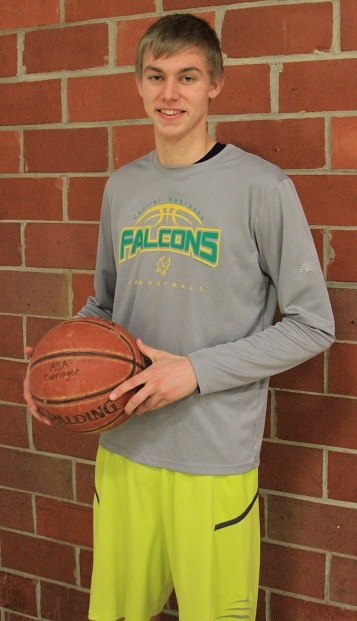 We’ll be there for two weeks in a row – helping in the kitchen during a junior high session, and team-teaching a Bible class during a senior high session. Since we just got back from a week long trip, and I am still playing catch-up…I am not even close to being ready to be gone again for two weeks. I’ve decided it just doesn’t matter. Ready or not, I can’t wait to be there. After all, God didn’t call me to go and ask me to get all my ducks in a row. He just said, “Go.” The to-do list will take care of itself. Friday and Saturday – grabbing the boys from camp to head to a short but sweet family reunion. Nothing like adding more traveling and packing and laundry and FUN to life before heading to camp for two weeks, right? Have any fun plans coming up in July?